A sometimes interesting, often dull look at the life of this alcoholic painter and how he came up with his unusual style. Jackson Pollack was one of the most unusual painters of all time. he began his career making paintings that were similar to picasso’s with strange images and faces weaving in and out of different shapes. that was the most conventional he ever got. from there, he stopped painting onto the canvas and started dripping paint off the brushes. he became known for this sort of speckling drops of paint everywhere-kind of art. it’s unique to be certain, and boy does he choose the right colors in the right places, but i’m still not convinced of how much control he could really have when just letting the paint fall off the brush. the movie gets into that a little bit, but not nearly enough. that’s because it is more concerned with Jackson Pollack’s life and only slightly concerned with his art. at the start of the movie, Jackson, (ed Harris), is a young man in new york. he lives with his sister and her family in a tiny apartment, because he has no money. he paints all day, and what little money he does take in, he goes out with and blows on booze. he’s a drunk and an unhappy one and he often brings his problems back into the house with him, imposing them on the family. things are not so pleasant here, at the start of the picture. 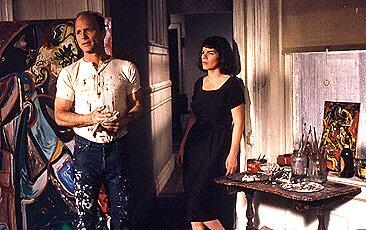 one day he meets lee krasner, (marcia gay harden), and things change. she is a fellow author and is also showing off her work in the same gallery alongside Jackson’s. she comes by to the apartment to look at his work and learn about him and falls in love. she is blown away by his art work and starts asking friends like clem, to come over and take a look. these friends end up writing about Jackson and getting his name out there, into the public. at first krasner has to deal with Jackson’s drinking too, and in one early scene she sits at the table with him and his family and watches him go off, playing the drums on the table. she holds him and tries to calm him down, but he’s the kind of guy who’s gonna do what he’s gonna do. 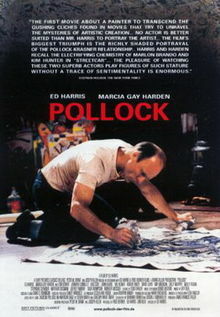 even when Pollack’s art gets the attention of peggy gugenheim, and she gives him a whole ton of money to paint a mural for her, as well as making giant shows for him, he still can’t put the bottle down. at an after party following one of these shows, at guggenheim’s house, Pollack is so drunk that he goes over to the fireplace and uses it like a urinal. after a while, krasner convinces Jackson to move out to the hamptons with her. they want to get away from manhattan and the glamorous city life and see if maybe that can help him leave his troubles behind. he gets a lot more space to paint, first in the house and then in a large barn, and everything seems to be going great. there is a nice conversation between the two of them on The Beach about getting married. krasner gives Jackson an ultimatum and he responds by agreeing to marry her. somehow they end up never discussing kids. that will be a problem for them later on. one of many. out in the country, they invite their old friends to come up and visit and take a look at what Jackson has been working on. Jackson continues drinking as he watches his friends walk around the barn and take in his work. he acts like they are judging him as they make comments about what they see. in one terrific scene, Jackson dwells on the only painting clem criticized. he won’t let the comments go and asks others if they agree with clem. he goes as far as to bring the painting into the house and gets all ready to destroy it in anger. but he can’t. and clem makes note of this, pointing out that no matter how drunk and how angry Jackson gets, he cannot destroy his own art. he loves it too much. it’s at about this time that two big things happen. Jackson gives up drinking and he also discovers his new dripping paint style. the movie shows how it happens as an accident one day, with him staring at some dripped paint on the floor and getting the idea in his head that it would look perfect that way on a canvas. and so he begins trying it. he walks on the canvas, barefoot, and splatters paint wherever he thinks it might look nice. by the time he’s done, he has an unusual and creative masterpiece. this brings him new attention and much bigger and more popularity than he has ever had before. suddenly he’s a household name, having articles written about him in newspapers and magazines. the movie waits until it is past the half way point to start showing us this new style, and i suppose there is a reason for that. it wants us to get to know the character first, and the man’s life. it feels that it has enough of an interesting story to tell in the first half, and wants to save some new excitement for the second half. everything seems to be going fantastic until Jackson agrees to let a professional film him making a painting by getting underneath a glass table and shooting up, capturing Jackson’s every facial expression. this is too much for him and he loses it, grabbing a bottle and going right back to drinking. things take a turn for the worse from here. first it’s throwing over the table that is covered with food for him and his guests. then it’s the sleeping around with younger girls, such as the naive jennifer conelley. and finally it is the car accident and death. Pollack has a lot of interesting things going for it, but they only pop up sporadically. especially in the first half. we are interested in his art and whether or not he actually had control of what he was doing, but the movie only gives us one interview about that. maybe a conversation with one of his friends asking him about it might have helped. instead this movie wants to tell the life story of a drunk who made it big, and most of that we’ve seen before. when it’s about the art, it’s great. when it’s about the man’s life, it’s nothing really new. the movie is also not nearly as exciting or uncomfortable as it should be. only in the later parts of the film do we really start to feel how awful this guy is and how terrible it must be to even be around him. the final car accident scene is scary as hell, and it is the most memorable and emotion-grabbing moment of the movie. there should have been more scenes like that which happened a lot earlier on. there’s plenty to like about this movie, and the story is certainly interesting, but it could have been told in ways that seemed to have the audience more in mind.